For a variety of reasons, we’ve been thinking a bit about the connected physical/digital retail experience recently and how we can help make it better. We were thinking about the barriers to a connected retail experience for consumers and how our software Engine for Active Digital Identities™ could solve them. This was for internal purposes but we thought it would be useful to jot down and share what we came up with. Consumers are using a very wide array of mobile devices with multiple operating systems, and this diversity of consumer device landscape is likely to escalate over the coming years. Further, consumers will be engaging shopping experiences using multiple mobile applications, potentially provided by retail brands, manufacturers and other service providers. The approach to serving the connected shopping experience needs to positively engage this multiplicity and diversity of device and application user interface consumers may be using when connecting with and interacting with a product in retail, while preserving economies for supply chain and production processes. How we can help: EVRYTHNG provides technology to separate the management of product information and consumer access to that information from the application layer. In other words, our technology enables consumers to take ‘digital’ possession of a product (checking-in to it so to speak), and for personalised services to be provided around that individual product and consumer relationship. This enables a rich environment of diverse applications to be provided, accessing and augmenting a common data layer or information envelope associated with each individual product. Multiple connectivity technologies are already available and more are becoming available for products. These include QR codes, NFC tags, a variety of flavors of RFID, embedded controllers and cellular connectivity modules. The cost of adding and operating connectivity is a critical consideration for manufacturers and distributors. For high volume products connectivity has to be achieved at extremely low costs per unit. Similarly different connectivity technologies offer benefits and challenges for different applications, and are more or less applicable to different audiences (e.g. consumers vs. retailers vs. distributors). Consumers may engage with products through QR codes or NFC tags using smartphone devices, while these same connectivity technologies can be used within the supply chain to manage product distribution and authentication. The challenge therefore is to support multiple connectivity technologies, potentially concurrently, and allow applications to be built in a way that is as agnostic to connectivity technology as possible. How we can help: The Active Digital Identities™ supported by the EVRYTHNG Engine supports the encoding and integration with multiple tagging or connectivity technologies, with each connecting back to a shared and common Web presence and software avatar for the product concerned. This enables different interaction and connectivity channels to access and utilize the same product identity and data repository for a product. For example, consumers using mobile devices can connect with products tagged with unique QR codes or NFC tags, accessing digital services. Critically, each individual product can have its own unique identity. Connected retail involves consumers commercially engaging with products. This, by definition requires the integration of authenticated user identity and authenticated product identity. Without distinct and authenticated product identity the scope of applications and services that can be provided associated with products is limited – it is crucial to have strong, authenticated logical relationships between user identities and product identities for post purchase applications such as service and support. Multiple user identity repositories now exist and are applied in the connected retail experience, including social networks, mobile networks, payment providers and other service providers. 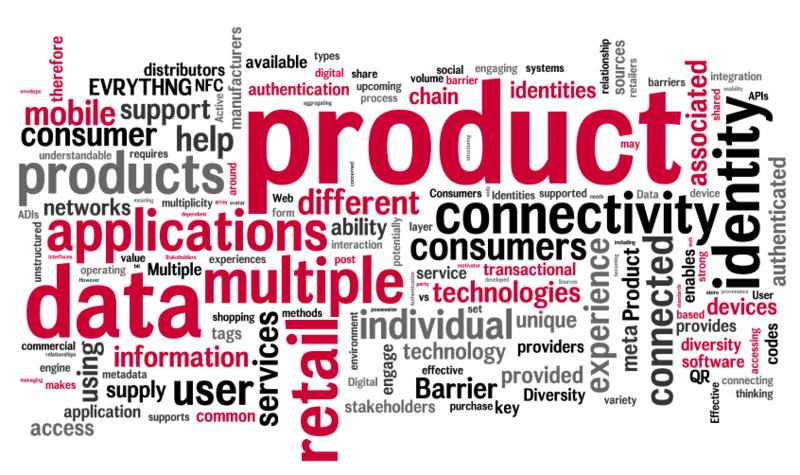 A barrier therefore to effective connected retail is the ability to support and integrate a multiplicity of user identities schemes, and an ability to provide a strong and persistent product identity with which to associate a user identity. How we can help: EVRYTHNG supports linking multiple user identity types from social networks, mobile networks and enterprise registry systems with ADIs. ADIs themselves support authentication methods to validate unique product identity, combining online and tag based credentials. Effective connected retail application experiences and services are dependent on the availability of product information – provenance and other product related and supply chain meta data – that can be aggregated and shared with multiple applications. This meta data emanates from many different sources – manufacturers, distributors, retailers – and holds important commercial value for each of these stakeholders. The barrier to effective methods of aggregating these multiple data sources is the ability to assign meaning to the data (semantically) that makes it understandable to third party applications, and for recognizing and managing the commercial value, proprietorial and regulatory issues associated with these different data elements. How we can help: EVRYTHNG provides software services to store, consolidate, process, and share data about individual products. Various standards for describing the metadata of products and services in a machine-readable format are being developed and will be publicly available in an upcoming release of the engine. This, combined with authentication and access control logic based on user identities, makes it much easier to develop secure cross-institutional applications that are centered around large amounts of real-time data about unique individual products. The connected retail experience provides tremendous potential to gather and feedback valuable meta data from consumer and product interaction as products travel through the supply chain, retail environment and post-purchase consumer / product relationship. The ability to generate and access an expanding stream of transactional data is a key motivator for why the multiple stakeholders involved in the retail experience and business process will engage. However the diversity of this meta data, its unstructured form, and the volume of it are key barriers. It is therefore key to resolve how multiple transactional interfaces – consumer mobile devices pre and post purchase, retail point-of-sale, supply-chain – are able to contribute to a growing temporal data set associated with an individual product, and how that data set is accessible and understandable to multiple stakeholders. This requires well understood and robust APIs supporting multi-dimensional query types, and semantic structuring of the data to maximize its usability. How we can help: EVRYTHNG’s technology facilitates the implementation of complex analytics solutions by providing a common Web container for a single product identity where transactional information from multiple sources can be easily integrated. Thanks to our upcoming product support and for this product data to be accessed in structured and unstructured form through web APIs, applications that require individual product metadata and other data will soon be supported.